Description: ex O&W 116 northbound with NYSW 3000 on it's way to O&W days at Norwich NY. 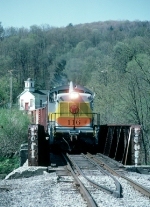 Description: 116 leads the local out of Binghamton past the former dairy buildings in Greene. Description: NYSW acquired this ex NYO&W switcher and restored it to its original paint job. Here it is at Binghamton in the company of a BN F45, an unlikely a combination of power as youll ever see. 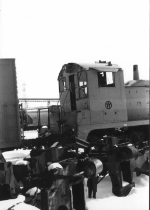 Note the D&H hopper at rear in the yard. Description: The 116 heads eastbound lite past ZINC. Photo by my father Jim. Date is approximate. Description: How times have changed...back when the line was reopened NYSW 116 trundles eastbound with white flags. Photo by my father Jim. Date is approximate. Description: The crew of a southbound NYS&W train stopped in Cortland to switch cars, and they made use of this unit while there. Description: Tied down along the Southern Tier at Frito-Lay. Description: Power sitting in the yard. Description: After years of searching, we have finally found the Susquehanna's O&W switcher 116 OOS at Binghamton yard. Hopefully if not used by the Susie Q, it will be preserved by a museum or other historical group. Any bids? Description: The NYS&W 4 axle fleet, minus a few that are still in service. Description: Former O&W NW2 #116 and a fromer P&W U23B sit OOS on the NYS&W. 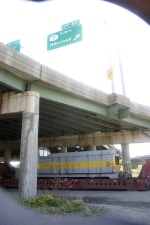 Title: O&W 116 set on a trailer awaiting for permits from NYS DOT, she is headed north to a new home. Title: 116 sets on the4 trailer owned by Bennet trucking. 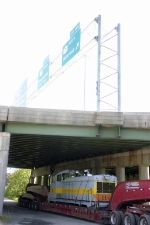 Description: NYSW 116 in Binghamton, NY. 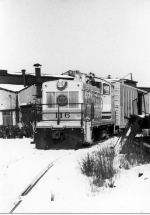 Description: NYS&W 116, restored to original O&W colors, sits out of service on the siding by Bevier Street. Hopefully the locomotive will be preserved seeing as how it's the last NYO&W NW2 in existance. Description: After months of storage on the NYS&W, the Ontario & Western 116 can finally be preserved and enjoyed for generations to come on the Delaware & Ulster Rail Ride.